We woke up to a great view and kangaroos in the valley below our mesa campsite. So, we hiked down and stalked the two groups of roos for an hour to get some morning sunlight photos/videos. Our drive to the town of Birdsville was on a nicely graded dirt road. We were able to maintain 45-50 mph for most of our first full day of dirt road. 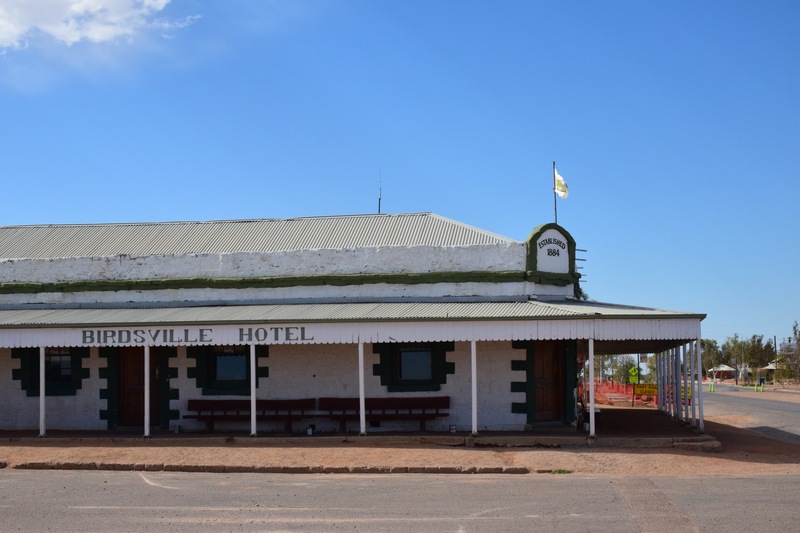 When we arrived in Birdsville, we decided to lunch at the Birdsville Hotel. If you don’t speak Australian, a “hotel” seems to be a bar or a restaurant or a hotel or any combination thereof. LeeWhay and I both thought the food was meh. Next, we we consulted the Hema Maps 4WD Maps App on the iPad. By this time, we had decided on our route we would attempt through the Simpson [more here]. So, it was time to do some distance calculations – about 444 miles between gas stations. Then, it was time to do some fuel calculations – 74 gallons at 6 miles per gallon. 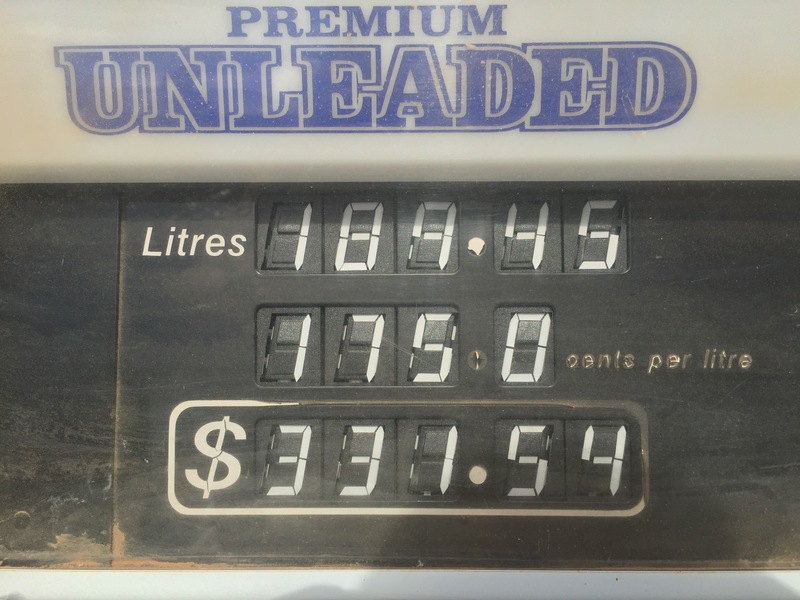 Then, we decided on an additional fuel reserve – 15 gallons. Then, it was time to double check the calculations, twice. A half hour later, we were fueling up to 90 gallons total! 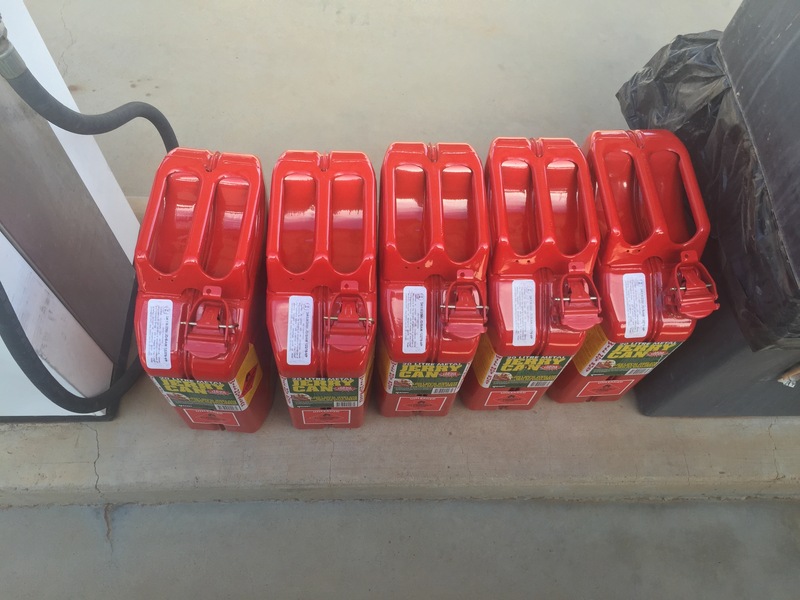 This process took around 45 minutes since it involved filling up the 25 gallon main tank, 28 gallon auxiliary tanks and seven 5 gallon Jerry cans. Normally, we carry two Jerry cans in Adventure Trailer Can Holders. This left five more cans to secure. Of course, we had figured out these locations back at home in our driveway before we left. Two would be ratchet strapped onto the trailer wings with brackets we fitted at home. And three cans would be ratchet strapped on the roof rack towards the front of the Front Runner Slimline II roof rack using tie down rings. While this is not the quickest or easiest method for transporting Jerrys, it was worth the extra time and effort to be able to see these more remote destinations. We have never needed more than the 65-ish gallons we normally have on-board in our US and Mexico travels. These temporary Jerry can locations are also not the safest. This is why we only carried full cans there when we were on trails and not on the highways. After the hard work of fueling up, it was time to find a campground. The only place to camp that had facilities was the Birdsville Caravan Park (known as an RV park in the US). 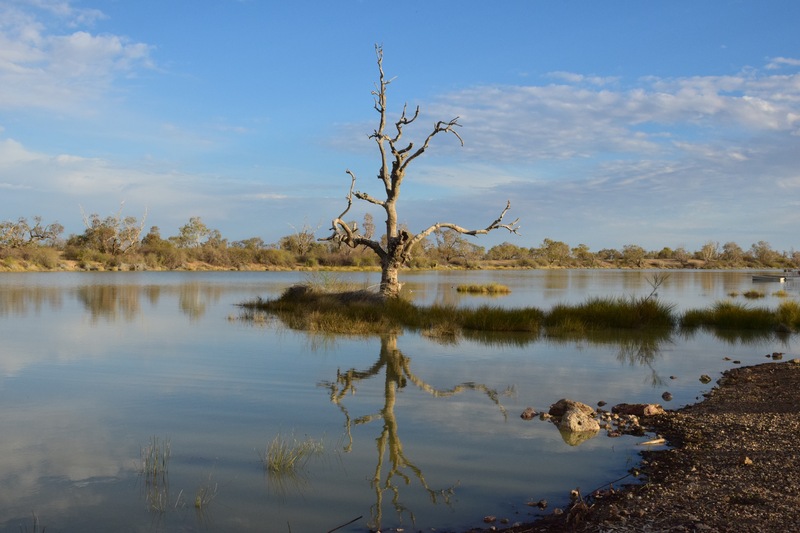 It was located on a pretty spot by a back water (or billabong or swamp) of the Diamantina River. Many birds were attracted to the calm water and vegetated banks. The next order of business was for LeeWhay to find groceries and for Ryan to take a nap. I’m happy to report that both missions were accomplished that afternoon! After reading that Birdsville has a huge annual horse racing event and is the gateway to the Simpson Desert, we discovered that the town was not as large nor have as much as I was expecting. For example, the grocery store was more of a convenience store at a gas station, there were only two restaurants, two gas stations, and the intermittent internet service was only available at one place – the visitor’s center.